400.000 unique proxies every day! Exclusive and Personal proxies! Last edited by RSocks; 07-25-2018 at 12:23 PM. 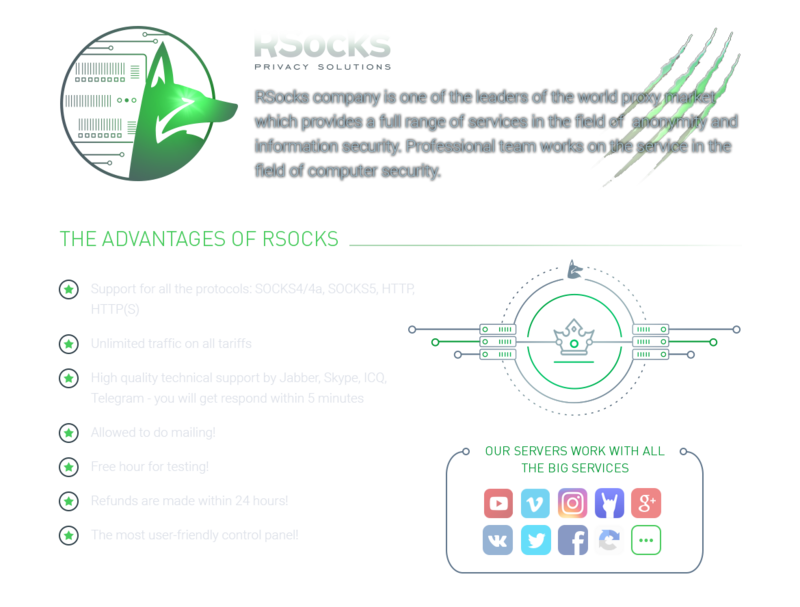 RSocks Project is one of the leaders in the world proxy market, providing a full range of services in the field of anonymity and security in the network. More than 30 people work on the service. We offer you the possibility of a quick start to the business of selling our proxy services under your brand, based on the White Label model. Branding. The service will be designed in your style and on your domain. Finished infrastructure. You immediately get a platform in which all the important features for the convenience of the client's work with the proxy are implemented. Update. Constant free update of the software core and the entire platform. Support for many languages. Platform in Chinese, English and Spanish! What makes it possible to sell the product right away in many countries. API. Your customers will have support for all APIs that we have in the system and upon a request we will add new ones. Support. If you do not cope with the flow of customers, you can connect our specialists to resolve issues with customers. Payments receiving. We can also connect our payment systems to your service, what will let us be sending funds to you instead of you sending funds to us. The proposal can be interesting to both current market players who expanding the range of services and increasing the quality of services, as well as for new companies entering the market. So many companies are already successfully working on the market this way! Also we can connect the following services for you by request: VPN, Personal proxy. Send the request today and you will be able to start your proxy service in the shortest time! Or maybe you have your own proxy and you do not want to bother with finding customers? Then just write to us and we can connect your proxy to our service, thereby creating a large flow of customers and income for you! RSocks wishes you a Merry Christmas! Please accept the most sincere wishes: professional successes, new victories and achievements, fulfillment of the set goals, good health, joy and happiness, peace and prosperity! We hope to continuation of our cooperation! RSocks team congratulate you on Christmas and Happy New Year! One of the main holidays - New Year is approaching fast! Of course, the RSocks team can not skip and leave our dear customers without gifts. 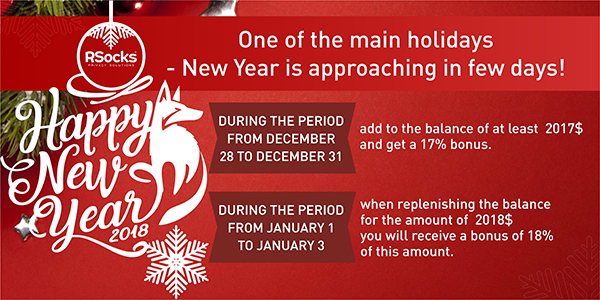 During the period from December 28 to December 31, replenish the balance by at least 2017 $ and get 17% bonus. During the period from January 1 to January 3, replenish the balance from 2018 $ and you will receive a bonus of 18% of this amount. Attention: if you replenished the specified amount and ordered a moneyback, only the replenishment amount, without interest, will be returned. To participate in the offer, you only need to write to support team immediately after you credit funds to the balance. Summing up the outgoing year, we want to say that this year has become for us a year of victories and achievements. All the goals that have been set for us this year have been achieved. Thanks to this, we firmly consolidated our position as a leader among the services to ensure privacy and anonymity on the Internet. 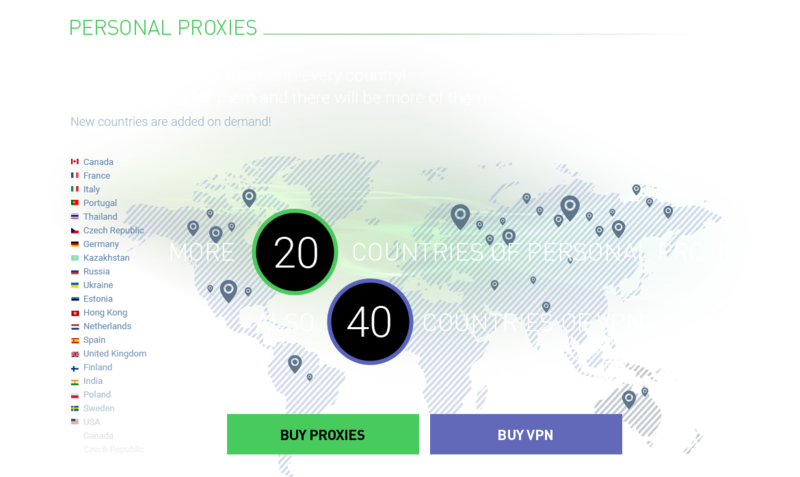 Having done a great job this year, we launched a VPN service, in which more than 30 countries are available. Also, we began to provide personal proxies for our customers with a large selection of countries, promptly adding new countries upon request. No service can boast of this! For this year our services have already benefited more than 4,000 people, and more than 15,000 have registered! This is a record figure! Now everyone can open their proxy service thanks to the "White Label" model! This year we began to conquer new countries: China, Spain, Brazil and many others! Our technical support now can communicate in 4 languages: Russian, English, Chinese and Spanish. And most importantly, our team increased from 16 people to 35 in just 10 months. We work hard to provide you with quality services. All this became possible only thanks to you! Thank you, friends, for such trust! We believe that this is not the limit, and we intend to surpass our own results next year. In 2018 we prepare for you a lot of interesting and useful innovations, the expansion of the tariff line, the launch of new packages, the increase in online. At the same time, the quality of our services will only increase! The RSocks team wishes you to Happy New Year! We wish you success and progress, growth and development, achievement of the set goals and conquest of new heights! Discover new horizons with RSocks! And do not forget that our support works 24/7 even on New Year holidays! Write to us at any time, we are always glad to see you! Hello! We are glad to bring you the latest news on the RSocks project! The homepage and your panel page are now available in German to all users. concerning the acquisition of a proxy in German. Updated dashboard at your personal area. For the convenience of working processes of our clients we have updated the main page of your panel. From now on, all the necessary information for tracking the status of your purchases is in a prominent and convenient place. Additional blocks for quick display of tickets, news and fresh blog entries are also displayed on the new start screen. And as for users of our referral system, a convenient block of tracking information on new referrals has been added. we strive to make the most comfortable environment for the work of all our customers! New countries are available for work. as well as in the near future, a general list of server options will be added. Only Thailand was added to the list of available servers for VPN. Support for HTTP (S) and Socks4a on personal proxies. there is an opportunity to work through the protocols HTTP (S) and Socks4a. IT-technologies and security - write to us in a personal on the forum! Do not miss the opportunity to become part of the RSocks team! New Geo for Personal proxy! Go to page of Personal proxy. Launched a new VPN server in Finland! From today, you can use a server in Finland to work with VPN. The server is already available for selection in RSocks VPN application on all platforms. And also, all previously available servers were replaced with faster servers. Now the connection speed through RSocks VPN is even higher! Go to page of VPN service. For all clients working with personal proxies, it added ability to use more than one IP binding. To bind an additional ip, specify it when purchasing or renewing the subscription. If you need an additional IP binding at the current personal proxy tariff, you need to contact the support with the appropriate request. An important point: The cost of each additional IP is 50% of the subscription cost. To work with VPN you can use the server in Austria, Romania, France. 3) The new package of standard proxies - China! The amount of online in the package is more than 6000 proxy. We remind you that the update of standard proxy packets occurs every 3 hours. At the same time, 30% of the proxy list is updated. 4) Hourly rental "World Mix 1"! 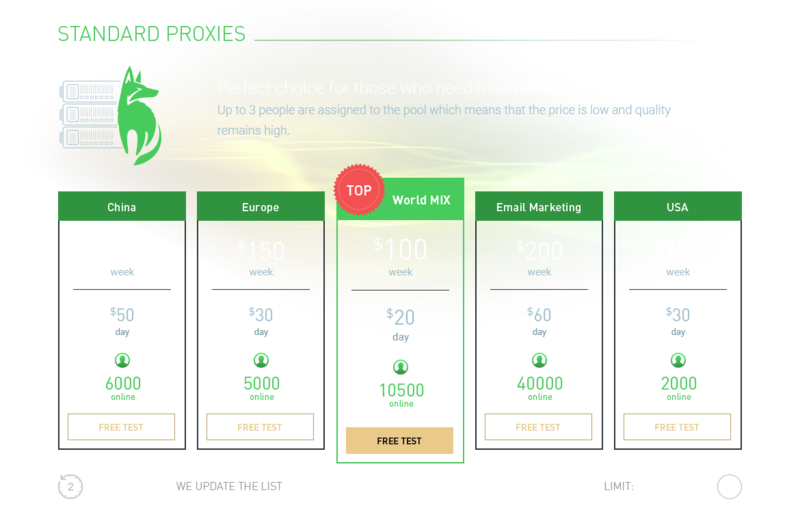 From now on, customers are available hourly rental of the package "World Mix 1" standard proxy. The cost of 1 hour of use is $ 5.